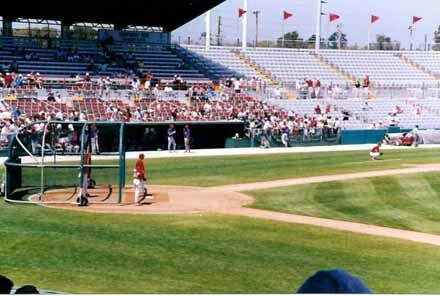 Jack Russell Memorial Stadium, located just north of downtown Clearwater, is a slightly better than average stadium that reminds me a lot of the Pirates facility in Bradenton. Jack Russell is one of the smaller stadiums in the area with a capacity of about 7,000. It has a vareity of different food options and a great gift stand. One drawback of the stadium is that it has so many bleacher seats, but that seems to be the trend stadiums are taken as they try to fit more and more people in each year. It gets really warm here, so try to get one of the seats towards the back under the giant overhang. If you are in the area and you have time to see Jack Russell, you should definitely go, but otherwise, you wouldn't be missing a "must see" if you skipped it. If you do decide to visit, be sure to sign up for the strangest contest I have seen in spring training. The Phillies sponsor a drawing that will move two fans from their seats to Lazy Boy recliners on the first base side. It is strange promotions like this that make spring training something special. This is the best spot to get autographs at any stadium before the game- on the baseline as close to the dugout as possible. There is a pretty lax atmosphere here in Clearwater, and players seem to be happy to sign autographs at this stadium. When I saw the Phillies play the Rangers, Juan Gonzalez walked into the stands and signed autographs near that banner at the top of the bleachers. You can see from the size of the shade in the picture that Jack Russell Stadium offers a good amount of shade. 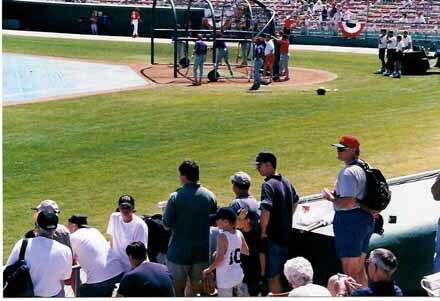 Autograph tip: I have always had amazing success at this stadium. Before the game, I like to wait near the dugouts, which is typical of most facilities. After the game, find the player parking lot exit, and the Phillies will roll down their windows and sign a few autographs as they leave the stadium after the game.